Cardamon Tea Lounge & Shop in Colchester, Essex is one of our favourite tea rooms to visit! They feature on our list of The Best Afternoon Teas in Essex. Cardamon Tea Lounge specialise in such imaginative themed afternoon teas and children’s platters. Each month they introduce us to an exciting new theme. 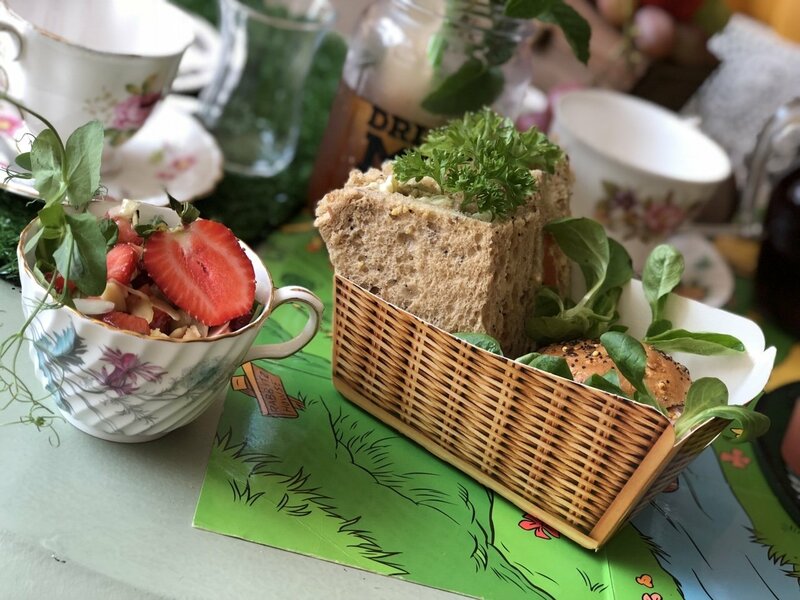 For the month of August 2018 is the Silly Old Bear Afternoon Tea. Perfect timing for any Winnie the Pooh fans out there as it hits the big screens the same month. 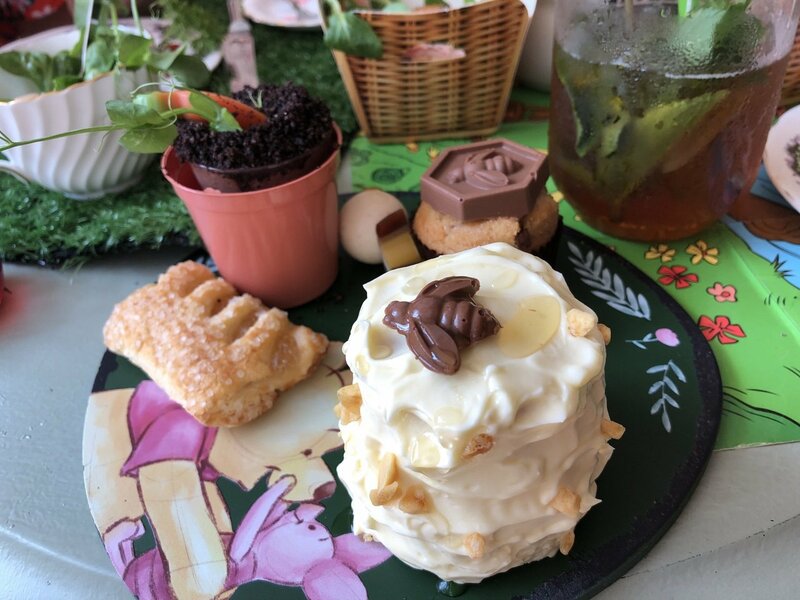 The Silly Old Bear Afternoon Tea is very charming. The thought, planning and effort that goes into each themed afternoon tea is incredible. The Silly Old Bear Afternoon Tea does not disappoint. Your table is decorated with cute Winnie the Bear themed props. A map of One Hundred Acre Wood with Winnie the Pooh and friends including Piglet await your arrival. The look is completed with crockery laid on its very own grass place mat decorated with carrots and flowers. The Cardamon Tea Lounge have over 50 wonderful varieties of tea to choose from to accompany your afternoon tea. 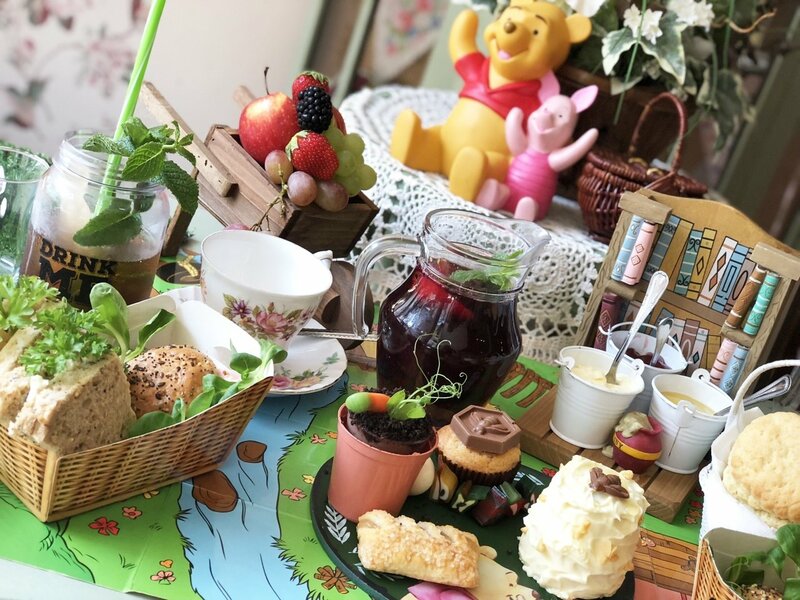 The Silly Old Bear Afternoon Tea can also be served with a delicious homemade fruit compote. Due to the hot weather, this time round I opted for a minted ice tea and it was the perfect refresher. The sandwiches were served in mini picnic baskets and were a great selection. My favourite was the vegetable salad and mayo, I didn’t know what to expect but it really was delightful. I think Rabbit would be a big fan! You also receive a cheese and tomato sandwich and a ham and mustard mini roll. 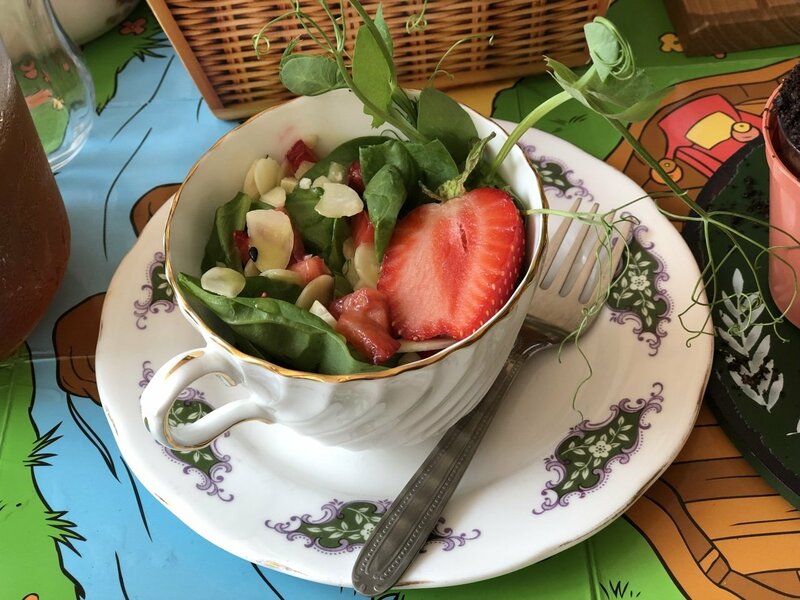 Alongside the sandwiches you also get a mini salad in a tea cup. A combination of spinach, feta, strawberries and nuts. It made a delicious accompaniment to the afternoon tea. 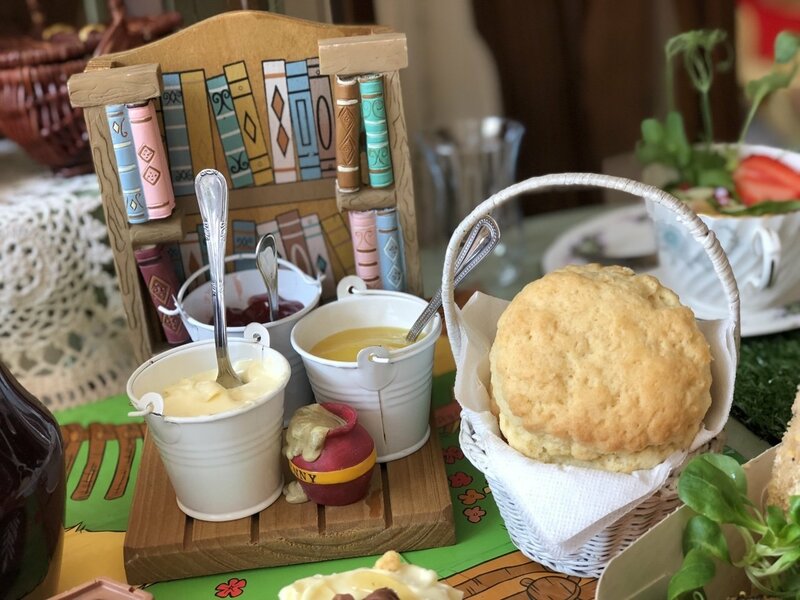 The scones arrived in their own mini picnic basket served with little buckets full of clotted cream, jam and lemon curd. The scones were delicious and freshly baked. ‘Winnie’s Delicacies’ consisted of a honey cake, chocolate mouse with chocolate crumble served in a mini plant pot, a mini muffin with vanilla cream centre and chocolate topper and a sweet pastry! The sweets treats were also accompanied with a wheel barrow of fruit and some sweets and chocolates! The honey cake was amazing, light and covered in cream and drizzled with honey, a sure favourite for Winnie the Pooh! 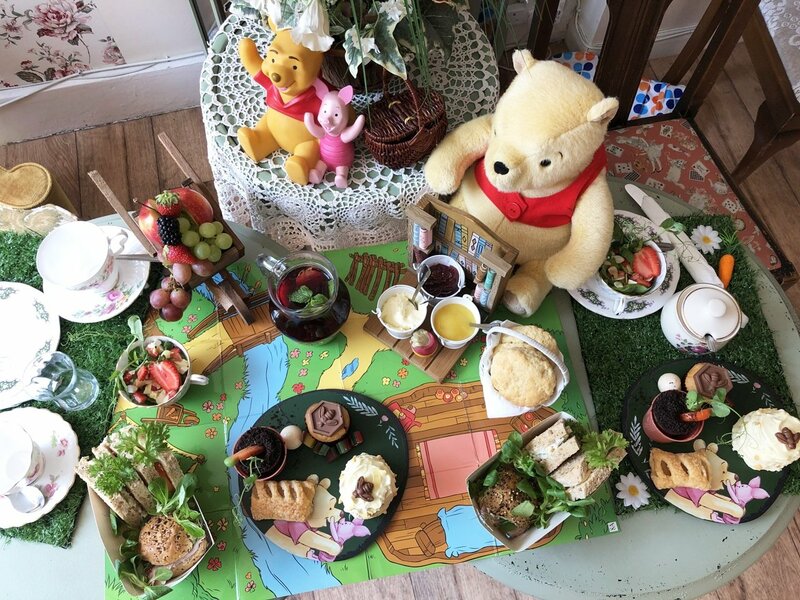 A children’s version of the Silly Old Bear afternoon tea is also available. 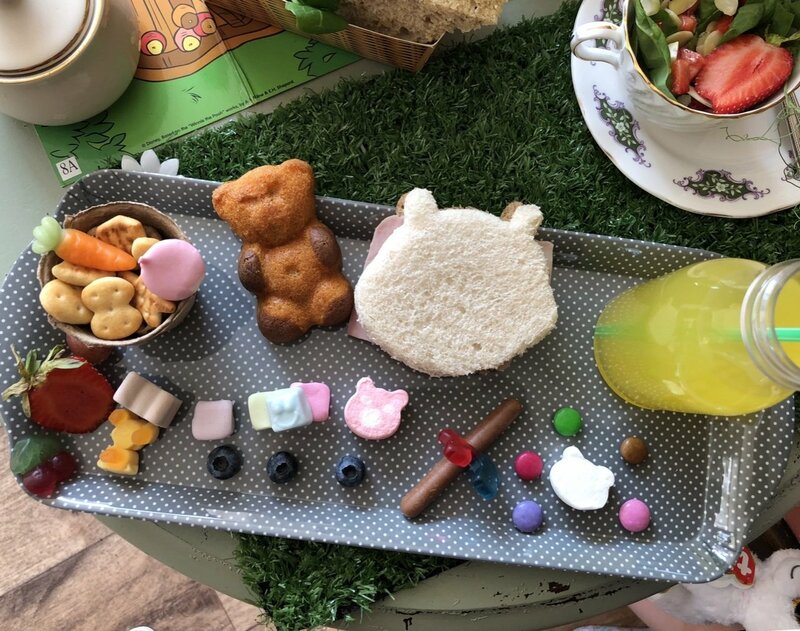 Each platter comes with a bear shaped sandwich, a mixture of themed snacks and treats, along with a drink. They are always so well themed and children love them! Very reasonably priced at £7.50 per child. 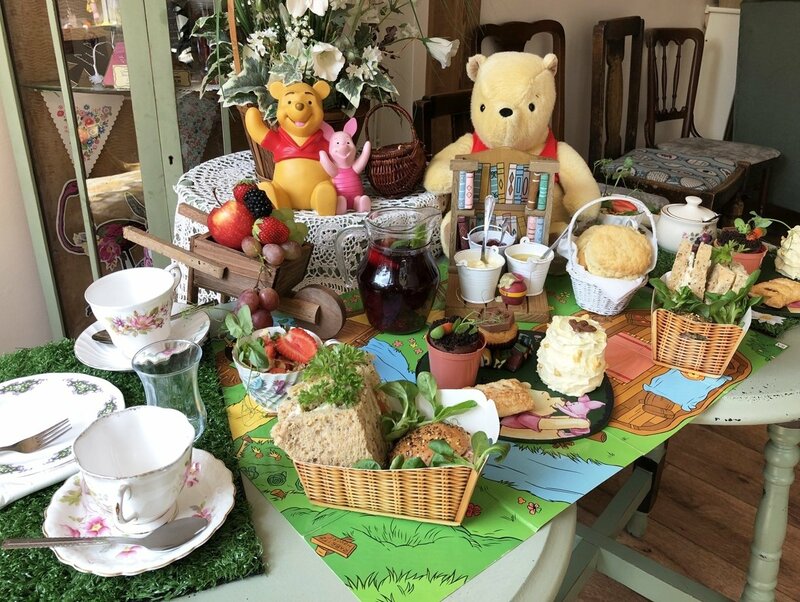 The Silly Old Bear Afternoon Tea is £20 per head and available to book for the month of August 2018 at the Cardamon Tea Lounge & Shop in Colchester. Pop over to their website or Facebook page to book or for further information. Written in collaboration with the Cardamon Tea Lounge, all views and opinions are my own.